Lebanese chefs react and wave Lebanese flags after preparing a massive bowl of hummus, seen in the middle, weighing 22,046 pounds or 10,452 kilograms, the size of Lebanon in square kilometers, during a bid to break a record previously held by Israel and reclaim ownership over the popular Middle Eastern dish, in Fanar, east of Beirut, Lebanon, Saturday May 8, 2010. 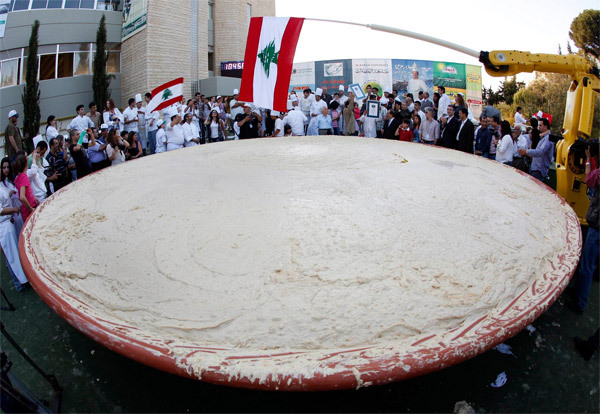 Some 300 Lebanese chefs prepared the huge hummus plate and doubled the record achieved by cooks in an Arab town near Jerusalem in January that weighed around four metric tons and broke a previous record held by Lebanon. A Guinness World Records adjudicator confirmed that Lebanon now holds the record.